Let's be honest — speed is the best secret weapon in a kitchen. While some recipes are designed to be long and leisurely, we all need a few options for those nights when time is limited and the urge to eat everything in sight strikes. As a general rule, it's best make use of pantry ingredients and quick-cooking proteins. Flexibility is also key. If you don't have every single item for a particular dish, get creative. Swap parsley for chives. Use orange instead of lemon. It will probably work out just fine. Here's what the CKC staff whips up when there's no time but lots of hunger. "This is a really easy but delicious fish recipe. It works with any fish, but salmon is particularly good. Get your pan hot with oil. (It needs to be hot enough to sear it fast.) Sear both sides of the fish until golden brown. With the fish still in the pan, add equal amounts of soy sauce and sugar (although I really prefer maple syrup). Use 2-3 tablespoons per one serving of fish. Add any dried or fresh herbs (fresh dill is best), a hint of alcohol (white wine is the best), and some black pepper. Cook on high heat (lower heat if fish is frozen) until liquid disappears and sticks to the fish. 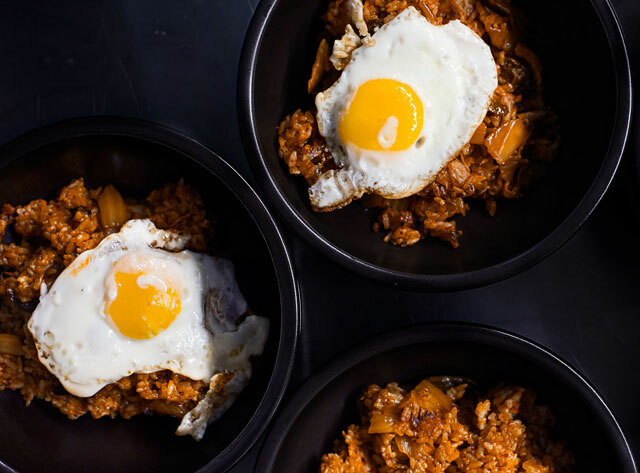 Here is your 15-minute Korean inspired gourmet dinner. Serve with lemon if you have any." "Gyeran Bap (egg rice). A bowl of warm rice, a pan-fried egg, soy sauce, and sesame oil. You can add gochujang to make it spicy. Mix it all together and break the fried egg. If you have seasoned laver (seaweed), break a sheet of it into small pieces and sprinkle on top." "Grill thinly-sliced Chah-dol-Bahk-ee (deckle in brisket section), or thinly-sliced Sahm-Gyup-Sahl (pork belly). Wash red leaf lettuce. Eat lettuce, grilled brisket, and rice with kimchi, Wholly Ssamjang — a dipping sauce made with gochujang and doenjang — and sesame oil dipping sauce, made with sesame oil, salt, black pepper. If you have some sweet mini peppers, green peppers, or garlic, slice them up, too. In Korea, when people don't have anything to cook with, or a group of people gets together, they say, 'Let's just grill sahm-gyup-sahl.'" "Anchovy pasta is fast comfort food in my apartment. Cook the pasta according to the box directions and then drain it, but not too well — you want some of that starchy water. In a saute pan, heat a tin of anchovies with some olive oil, sliced garlic, and red pepper flakes until the anchovies have melted down. Add the pasta and stir like mad until it all comes together. If I have herbs, lemon, or even some nuts around, I'll add them. But it doesn't need it. Anchovies, garlic, and oil are the perfect trio. They don't need backup singers." "For a lazy day recipe, I get sushi grade salmon from H Mart, fresh rice from the rice cooker and crispy seaweed. Fast and so yummy. It does help that H Mart is two minutes from my apartment."